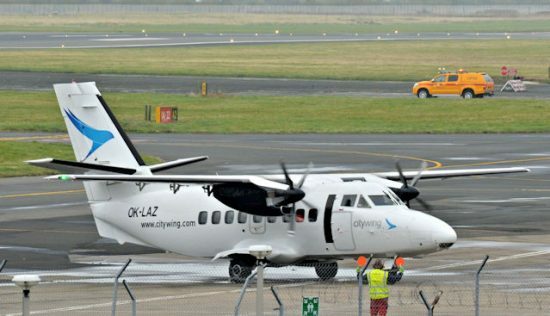 The U.K.’s Civil Aviation Authority (CAA) suspended local operations by Van Air Europe following a recent incident, according to local media. Van Air Europe is a Czech airline that operated flights on behalf of Citywing, an Isle of Man-based virtual airline. Citywing sells seats on scheduled flights which were operated under charter from Van Air. On February 23, 2017, Storm Doris was causing disruptions to air travel in the U.K. During the storm flight V9502 took off from Ronaldsway Airport, Isle of Man at 08:24 UTC on a scheduled service to Belfast City Airport. The flight was operated by a Van Air Europe Let L-410, registration OK-LAZ. The approach to Belfast City Airport was aborted due to strong winds, whereupon the flight crew decided to divert back to Ronaldsway. The aircraft landed at Ronaldsway Airport about 09:25 hrs UTC during very strong winds. After roll out the aircraft was escorted by fire and emergency services off runway 26. Unconfirmed reports say this was due to the difficulty encountered when attempting to taxi back to the ramp in strong winds. Metar weather data at the time show winds at 42 knots with gusts at 56 knots. This occurrence was apparently cause for concern, leading the CAA to the decision to suspend the airline’s operations in the United Kingdom. The incident aircraft, OK-LAZ, was ferried back to the Czech Republic on February 26, followed by another aircraft three days later.